In case anyone missed new comments by Jangada fan Paul Lima to an earlier post on these Brazilian raft-boats: Paul has provided a link to the wonderful video "Four Men on a Raft" by Orson Welles on YouTube: http://www.youtube.com/watch?v=fpdxGygXPzM. Although the video quality is poor, there's some beautifully-shot footage. Reader Chang kindly provided a tip on a French-language book about the Indonesian fishing boats called gole'ans or golekans, the type upon which Lance Lee's Lancing Madura project is based. Below are Chang's recommendations: unfortunately, both editions are out of print at the moment and unavailable on Amazon. Perhaps some deeper searching could uncover a copy. 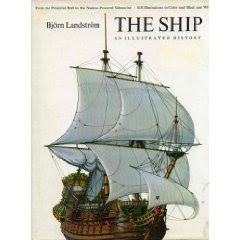 In response to valuable comments from Thomas Armstrong to my previous post, I went back to Landstrom's The Ship: Illustrated History and I find that I was misleading in my description. Landstrom did not suggest a direct connection between the Scandinavian skin boats and the umiak --rather, he suggested that Scandinavians had skin boats that were similar in some respects to umiaks, but he did not imply a technology transfer between the cultures. Sorry for the error, and thanks to Thomas for pointing it out. The Hjortspring boat with its peculiarities was the result of a very skilful builder's work. It is a round-bottomed boat made of five overlapping planks stitched together, midships 20 ins. broad and 5/8 ins. thick, which are joined to two end-pieces each hewn from a solid block. The bottom plank projects like the end of a runner outside the boat proper, and between this runner and the elongated "noses" of the end-pieces these remarkable vertical end-posts are fitted. When hewing the planks cleats were left into which thin ribs were attached with bass binding. Ten thwarts in the narrow boat gave room for twenty paddlers, and it is believed that the craft was used for warlike purposes. With its overlapping planks, this boat is approaching subject matter that this blog typically eschews: it appears to be in the line of development to the lapstrake boat that's at the heart of the western boatbuilding tradition. The description of the end-pieces does seem to be similar to those of the Polynesian five-part canoe, which I had discounted in my previous post. Reader Wade Terzia asked about Bronze Age European boats with "distinctive double-projections at the stem and stern" and known from petroglyphs. Interesting subject. The construction has caused much surprise, especially the shapes of the ends which do not appear at all natural for a boat of wood. It is the oldest find made in Scandinavia of a boat built of wood, and I believe that it was made with a hide boat as a model. So the Hjortspring boat, shown above, was apparently derived from the skin boat, shown below, in which the end projections make perfect sense from a construction standpoint. Landstrom sees a close connection between this skin boat and umiaks, and suggests that the keel extension would allow users to drag the boat ashore with less wear to the skin covering. And the evolution to the sewn-plank boat incorporated the extensions out of habit, not for any good reason in terms of boat construction or usage. Apparently, these extensions were abandoned as soon as builders in the sewn-plank technology figured out that there was no reason to retain them. Apologies for the poor quality of the Hjortspring image and the wretched stitching together of two scans. It is clickable, however, for a larger view. The image shows numerous planks stitched together, with a bottom member that might be a keel-like structure (but is not a dugout base) that extends beyond the stem and sternposts. The painting does not seem to show the ends to be "crotches" in the manner of the Polynesian five-part canoe: rather, the port and starboard sides of the end pieces of planking appear to be separate pieces that meet at the stem/sternposts. A caveat: Landstrom's book was published in 1961, and there may be much more recent research that either confirms or contradicts his views. But I just love Landstrom's paintings. I received the book for my 13th birthday, and I still treasure it. If Jerry & Marie Ruebenstahl are out there somewhere, thanks again. Wow. 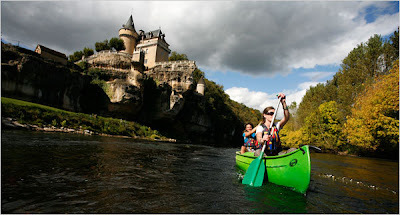 A homepage article in the New York Times featuring a canoe trip!